Tomophase Corporation, a leading developer of minimally invasive optical coherence tomography (OCT) tissue imaging devices, announced today that the Thoraxklinik at the University of Heidelberg, Germany has taken the first OCTIS images in clinical patients with the Tomophase OCT Imaging System (OCTIS™). 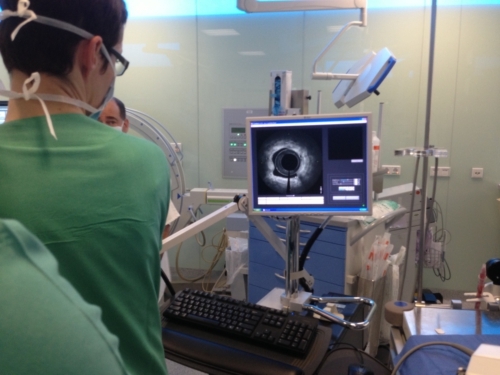 On Tuesday, May 7th Tomophase OCTIS was used for the first time to examine the airways of a patient undergoing bronchoscopy at the Thoraxklinik. The following day another patient was examined. (Courtesy of the Thoraxklinik, University of Heidelberg) The clinicians were quite intrigued of the results and plan to do further work in due course. The Tomophase OCTIS was used by Dr Ute Oltmanns, and deployed under the direction of Professor Felix Herth, MD PhD, Principal Investigator. The internationally acclaimed Thoraxklinik Heidelberg is one of the oldest and largest pulmonary clinics in the world, in service for over 100 years. Prof. Herth, Head of Pulmonary and Respiratory Medicine and Deputy Medical Director, is a widely respected interventional pulmonologist. Patients will receive a CT scan and in some cases will be followed up with Tomophase OCT Imaging. OCTIS provides real-time, high resolution imaging at a level which has not been previously available. The Thoraxklinik Heidelberg started as a convalescent home, then grew from a tuberculosis hospital into a clinic specialized in all thoracic diseases, and has steadily evolved into today's world-class Lung Center. The Thoraxklinik holds a lead position not just in Germany but in all of Europe, with around 10,000 admissions, 10,000 outpatient visits, and 2,300 surgical procedures performed annually. Tomophase is a leader in developing bronchoscopic-based systems for interventional pulmonology. Offering significantly higher resolution than either CT scan or ultrasound, OCTIS provides real-time, high resolution, sub-surface tissue imaging of airways and lungs, to be followed by diagnostic and therapeutic applications. Our goal is to provide physicians with heretofore unobtainable airway microstructural images to improve the management and clinical outcome of pulmonary disease. The company has 27 patent and applications issued and pending. FDA 510(k) clearance for OCTIS was received and the CE Mark is expected in 2013. The U.S. commercial launch is underway and the EU rollout is proceeding. The company is currently raising investment capital to meet the increasing international demand for the OCT Imaging System. Examples of our tissue imaging results are available at www.tomophase.com.